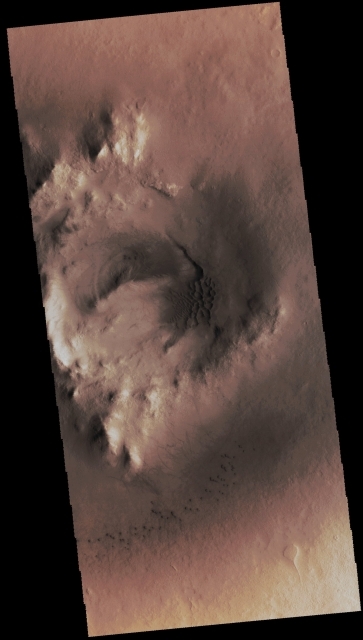 In this VIS Contextual Image (or "CTX" frame), taken by the NASA - Mars Odyssey Orbiter on April, 21st, 2016, and during its 63.676th orbit around the Red Planet, we can see (a small section of) the interior of Milankovic Crater (an Impact Crater located in the Diacria Quadrangle of Mars, having a diameter of approx. 118,4 Km, such as about 73,5264 miles. It is centered - roughly - at 54,7� North Latitude and 146,7� West Longitude). The Dark Dunes visible in the center of the image are in the Pit located at the Summit of the Crater's Peak. On the other hand, the small (but still Dark) Dunes located near the bottom of the image are on the Floor of the Crater itself. As a matter of fact, many medium-sized Impact Craters of Mars have/show (a) Central Peak (or Peaks) with a Summit Pit and, most likely (but we have - so far - no way to know if that theory is actually true) both the Peak/s and Pit/s formed at the time when the Impact occurred.